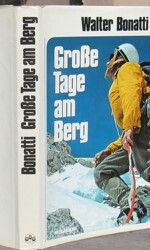 This is the first printing of the first German-language edition of GROSSE TAGE AM BERG by Walter Bonatti. 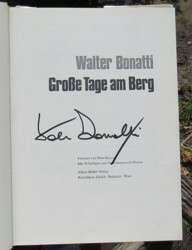 This example has been signed by Walter Bonatti on the title page. 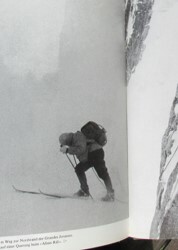 It was published in Rüschlikon-Zürich by Albert Müller Verlag in 1972. 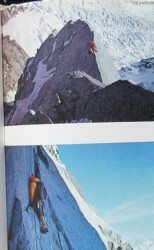 The book measures 262mm tall x 190mm, and has 182 pages + , 39 color & 36 b/w photos, 1 full-page route diagram. The text is in German. This is the German-language edition of The Great Days. This has a larger format with about twice the number of illustrations presented in the English edition. This edition is the same format and size as the original Italian edition, I Giorni Grandi. 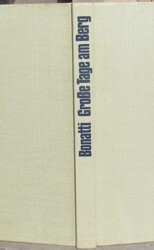 Bonatti’s second climbing autobiography—with poignant commentary on state and meaning of climbing—from 1961 until his retirement from major climbing. 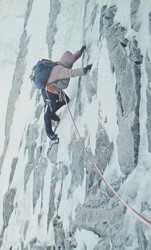 Includes Central Pillar of Fresnay tragedy, N. wall of Eiger, winter ascent Walker Spur Grandes Jorasses, first ascent Whymper Spur Grandes Jorasses, & the N. Face Matterhorn solo in winter. CONDITION: Original beige cloth, dark navy lettering spine. 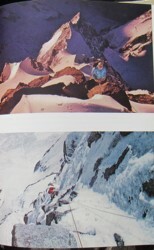 Original dust jacket has light edge wear, small 4mm loss upper rear, no tears. The book is in very good condition with minor edge wear, clean covers, no previous owner marks or writing on any pages, no foxing, solid binding. Price: SOLD.